This one-pot chicken and rice skillet recipe is a keeper. 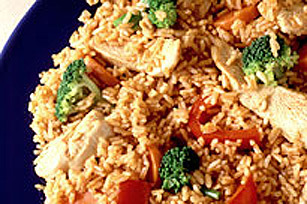 Add cooked chicken and chopped veggies to a skillet of simmering rice and you've got dinner on the table in 15 minutes. PREPARE rice substituting KRAFT CATALINA Dressing for half the water. ADD a dash of soya sauce. Cook 5 minutes. STIR in chicken cubes and vegetable pieces.